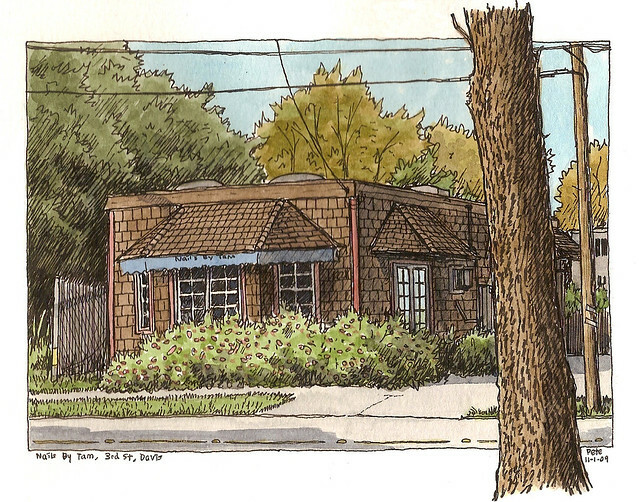 Aeons ago, when I first had a summer in Davis, I started drawing this town to build up an overall picture of it to post on my blog, so that my friends and family back home could get an idea of where I was now living. I was a Londoner, and Davis was new and totally different. I would cycle everywhere for a start, sometimes in heat that would make your eyes hurt. I would cycle home from downtown and pass this building, which was for a long time ‘Nails By Tam’ (which has now moved to F Street, or G, I can’t remember; I have drawn it, I’m sure). 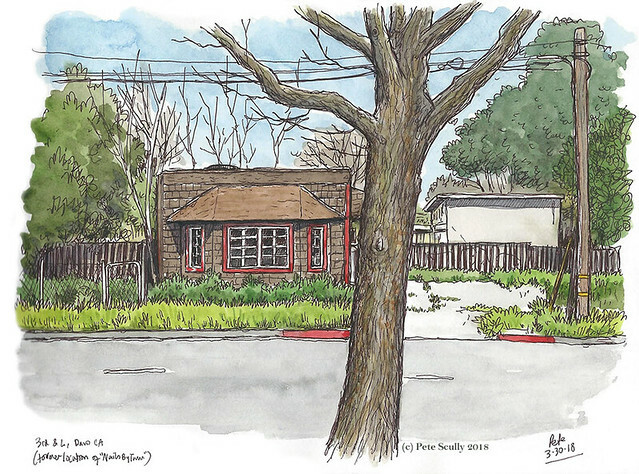 Well this little building was all by itself, plonked remotely at the end of 3rd St in the Old East downtown, and was the first thing I thought was totally sketchworthy in Davis. It wasn’t the first thing I sketched, but it was in that first summer’s sketchbook. Anyway I don’t cycle that way very often now, but I passed by there a few months ago and sketched it again, in the sunshine from across the street, behind the tree. It’s empty now I think. The spot has otherwise not really changed much, nobody has come in and developed it into an apartment complex or anything. Oh, here is that one from 2006. I wasn’t even using watercolours then, just colouring in with pencils. And below, another one from 2009.